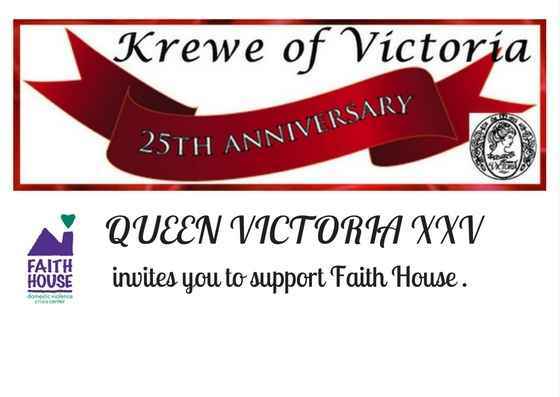 Queen Victoria invites you to make a donation to Faith House in lieu of gifts this Mardi Gras. Queen Victoria XXV feels drawn to the mission of Faith House and supports the survivors and children that flee their homes in fear and seek safe shelter and support with Faith House. Queen Victoria has been blessed during her lifetime and this Mardi Gras season she would like to support others in her community that are hurting and scared. This year, Queen of Victoria, is asking all to consider a donation to Faith House in lieu of gifts to her. Your donation will directly benefit individuals who are looking for safe refuge and support as they break the cycle of violence in their lives. Faith House is a domestic violence crisis center that serves 7 parishes from Acadiana to Central Louisiana. Our services include a 24-hour crisis line, emergency shelter, transitional housing, legal services, children services and prevention programs in our community and local schools. Our Mission is to provide safety, empowerment and advocacy to survivors of domestic violence.